“A light mobile safari is a private, low impact camping safari, in which our holiday makers travel with a dedicated guide and cook, vehicle and camping equipment, setting up camp in the bush each day,” explains Jeremy Gane, Managing Director of Gane and Marshall. The safaris use one vehicle to carry up to four guests plus all the camping equipment, reducing the carbon footprint often associated with larger touring safaris, which feature service vehicles and accommodation in fixed camps. The ecological credentials are further boosted if guests choose to bush walk for part of the itinerary, reducing vehicle usage. “Light mobile safaris also offer an affordable alternative to established safari camps, yet are still a comfortable and safe way to travel. Tanzania is fast becoming one of the most expensive countries to go on safari, but these new itineraries reduce the costs involved and also maximise freedom and privacy, making them particularly suited to families, small groups and young couples,” continues Jeremy Gane. Gane and Marshall’s light mobile safaris enable travellers to reach spots not visited by other tour operators. Founder, Jeremy Gane has forged an outstanding relationship with the Maasai people since his first visit with the community in 1995, and Gane and Marshall is proud to be the only established travel company to offer private, mobile safaris in the Maasai lands. Camping in the Maasai lands allows for genuine interaction with the local Maasai people, as well as the Chagga and Meru tribes. Maasai guides and camp staff take visitors to meet the villagers and educate them about the flora and fauna of the region. Gane and Marshall also offers light, mobile safari tours in Tanzania’s spectacular Northern Parks, including the opportunity to camp within the path of the Great Migration. Each tour is tailor-made and totally flexible. The Tribes and Wildlife of Northern Tanzania itinerary follows the route of the ‘Tanzania's Northern Highlights’ trip, visiting Tarangire National Park, the Ngorongoro Crater Highlands, the Serengeti and Lake Manyara, but then continues further into Tanzania’s northern lands. The safari moves along the Rift Valley floor to Engaruka, an ancient and now uninhabited settlement. Moving onwards, the landscape is dominated by the Rift Escarpment and the twin cones of Ol Doinyo Lengai and Kerimasi, where travellers will marvel at some of the greatest scenery in Tanzania. This area is part of the region known as ‘the cradle of humankind’ and between Lake Natron and Longido are two important Maasai settlements, Gelai and Kitumbeine, where guests can visit with the Maasai people. The final destination is Longido, where guests will trek to set up camp in a beautiful place in the foothills of Mount Longido. Land prices for the eight-day itinerary start from £1,930 per person if in a group of four, or £2,730 per person if in a group of two. The pricing includes safari transport in a 4WD vehicle, national park fees, camping and village fees, safari guide services for bush walking programmes, water, most meals and use of camping equipment including a cool box, chemical or long drop toilet, solar shower, tent with camping mattresses, bedding, a driver/guide and a cook/camp assistant. For return flights from London Heathrow to Kilimanjaro Airport (JRO), add approximately £700pp. The Tanzania's Northern Highlights itinerary starts in Tarangire National Park, one of the lesser known parks and famous for its large herds of elephant, tree-climbing lions and massive baobab trees, which brings a real air of undiscovered Africa. Next it’s on to the Crater Highlands and Ngorongoro Crater, arguably the best self-contained safari destination in the world, where the rich pasture and permanent water of the crater floor shelters a population of around 30,000 animals. The grasslands and savannahs of the Serengeti follow, home to a host of wildlife including wildebeest, zebra, gazelles, hyena, lion, leopard, cheetah and caracal. The final destination is Lake Manyara, which stretches along the base of the Rift Valley escarpment. Its ground water forests, bush plains and hot springs offer an incredible ecological variety and wildlife in a small area, including tree-climbing lions and a huge array of bird life. Land prices for the eight-day itinerary start from £928 per person if in a group of four, or £1,210 per person if in a group of two. The pricing includes safari transport in a 4WD vehicle, national park fees, camping and village fees, safari guide services for bush walking programmes, water, most meals and use of camping equipment including a cool box, chemical or long drop toilet, solar shower, tent with camping mattresses, bedding, a driver/guide and a cook/camp assistant. 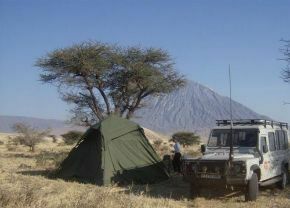 For return flights from London Heathrow to Kilimanjaro Airport (JRO), add approximately £700pp. The ‘Into the Maasai Lands’ itinerary is a fascinating, seven-night remote bush trek with the Maasai Tribe in the African Rift Valley, Tanzania. The region is home to several Maasai communities, perhaps the most revered of the great African nomadic tribes and once known as the fiercest of warriors. Beginning with a trek up to the viewpoint on Mt. Longido, a sacred Maasai mountain, travellers will then drive and trek across the floor of the Great Rift Valley, heading for the magnificent mountain massif, the Crater Highlands, and the world famous Ngorongoro Crater. Travellers will be able to see many of the major animal species of Africa, including lion, elephant and antelope along their journey. The itinerary ends with an evening of celebration at a special bush camp near Laibone, overlooking Lake Manyara. Land prices for the eight-day itinerary start from £1,589 per person if in a group of four, or £2,174 per person if in a group of two. The pricing includes safari transport in a 4WD vehicle, national park fees, camping and village fees, safari guide services for bush walking programmes, water, most meals and use of camping equipment including a cool box, chemical or long drop toilet, solar shower, tent with camping mattresses, bedding, a driver/guide and a cook/camp assistant. For return flights from London Heathrow to Kilimanjaro Airport (JRO), add approximately £700pp. For reservations and more information go to ganeandmarshall.com.